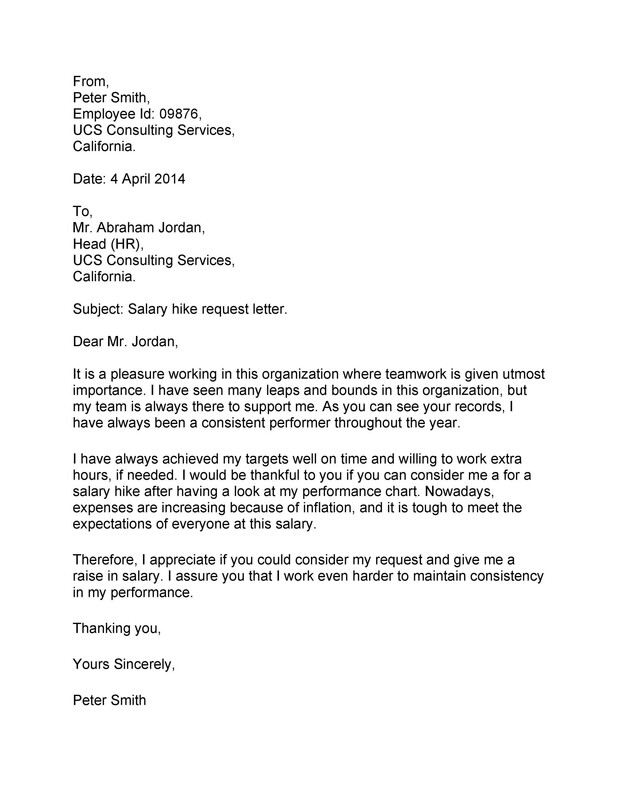 At some point, you may want to ask for a raise, especially when you feel like you deserve one. 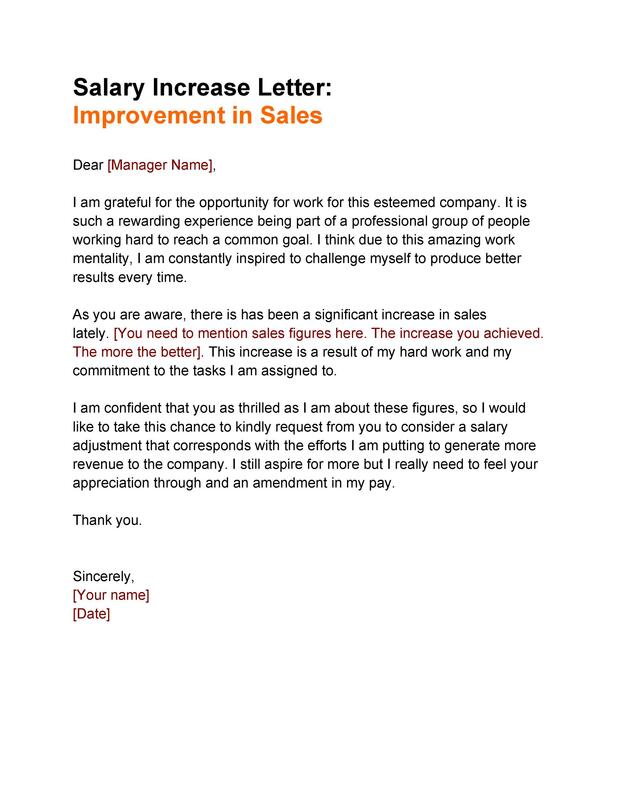 If you believe that you can provide your employer with a strong case for the raise you want to ask for, you can express yourself in writing through a salary increase letter. 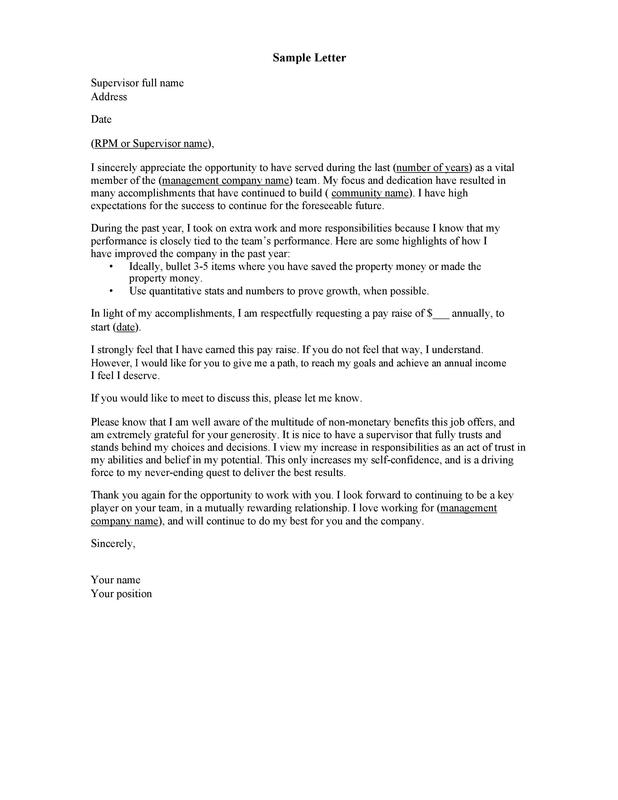 This letter will formalize your request and increase the chances of getting what you want. 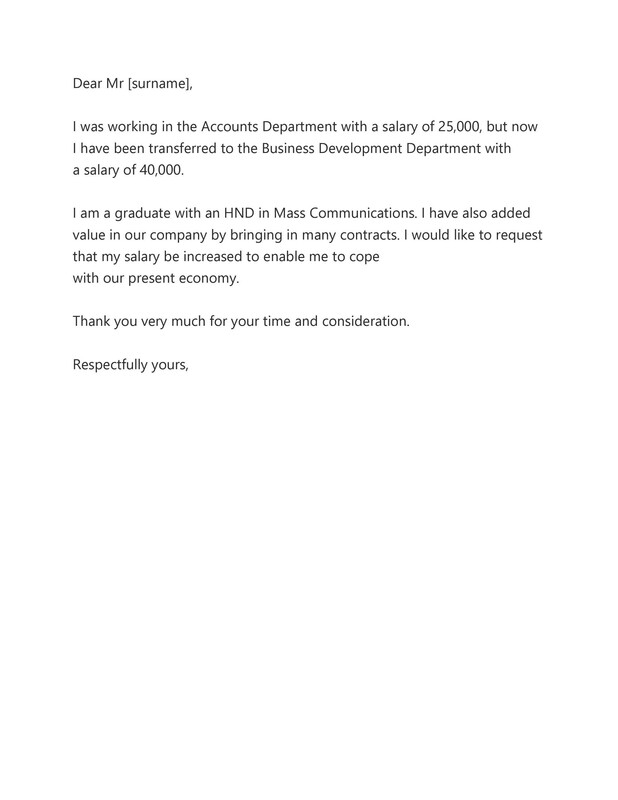 2 To whom do you give your salary increase letter? 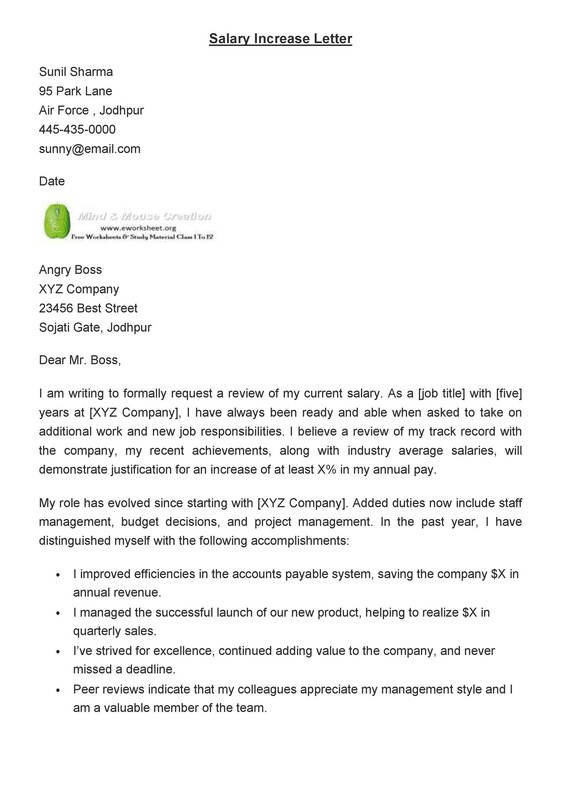 4 What should you place in your salary increase letter? 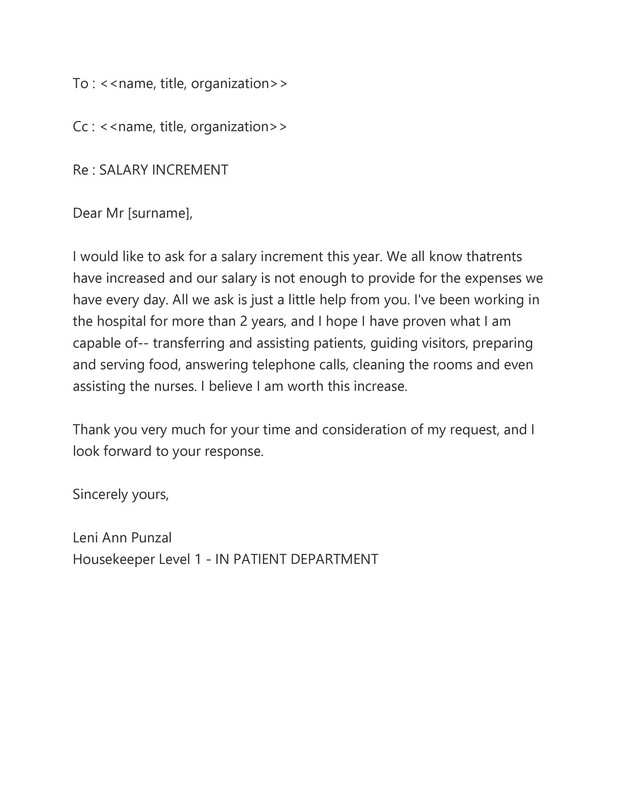 6 How do you ask for a pay raise? 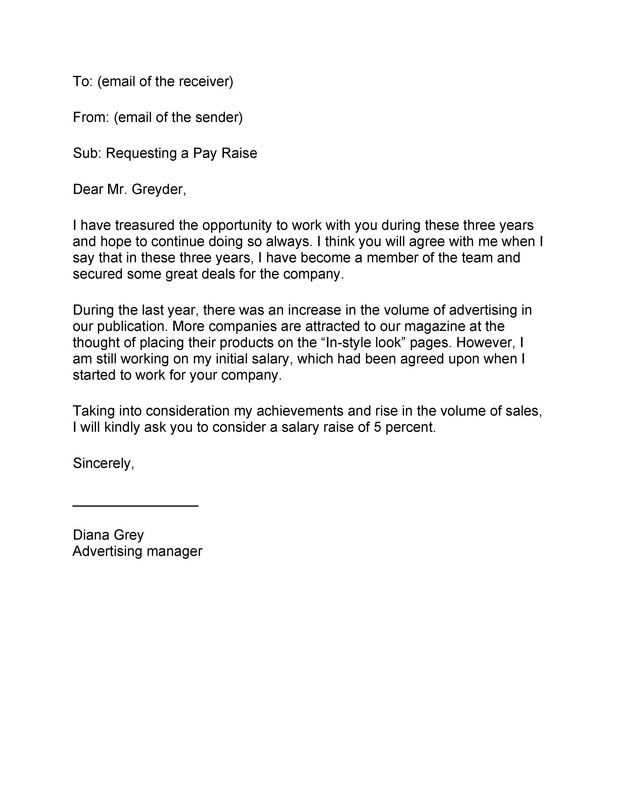 8 How do you write a proposal for a salary increase? 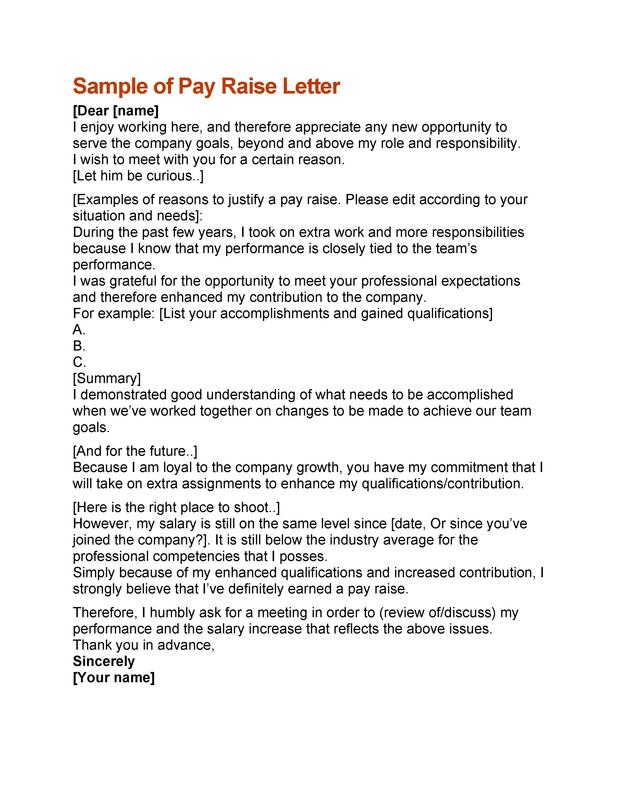 9 How To Ask For A Raise? 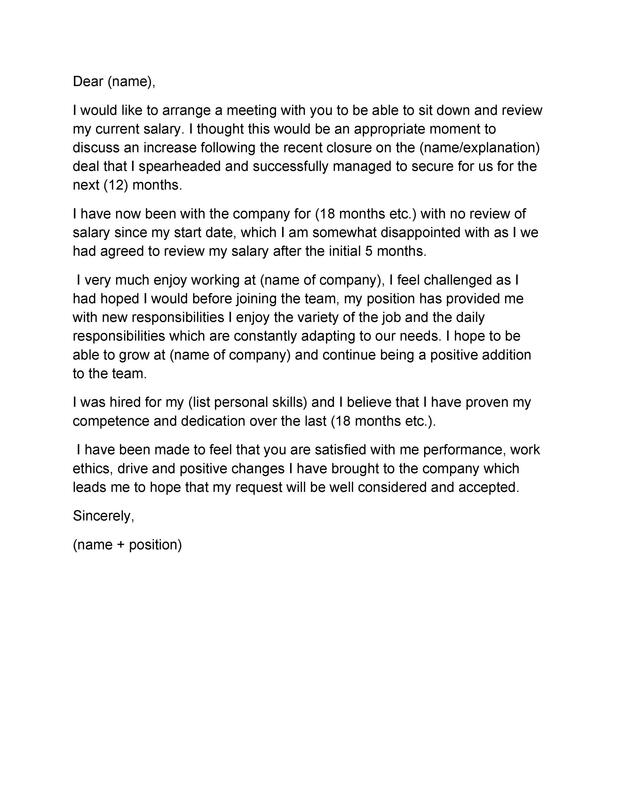 10 How do I talk to my boss about salary increase? 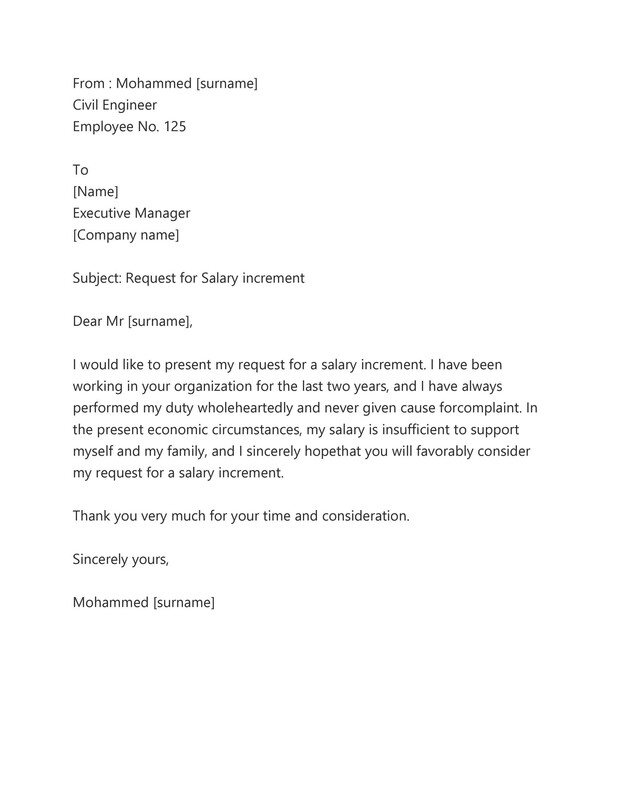 To whom do you give your salary increase letter? 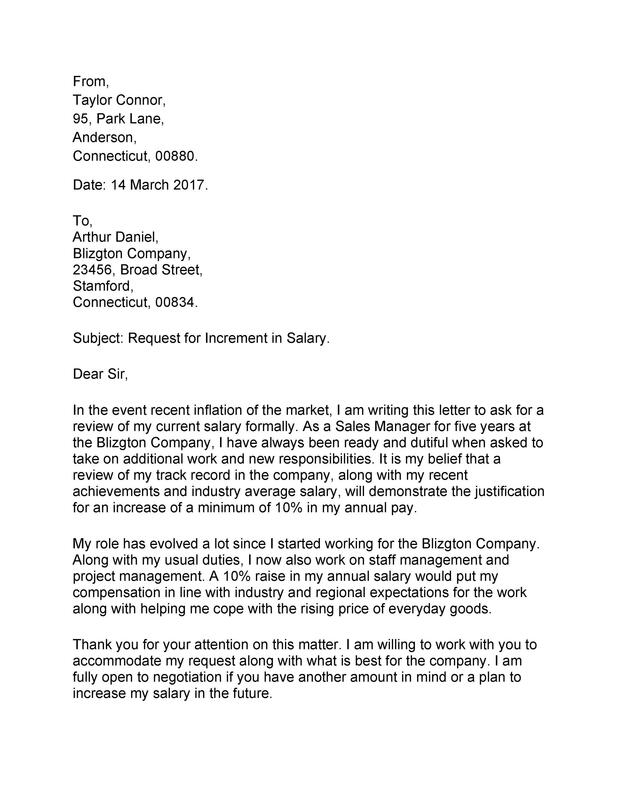 A well-written salary increase letter template can help back up your request while preventing you from saying the wrong thing in person. Also, it’s a type of written documentation which you can keep in your files in case it’s denied. 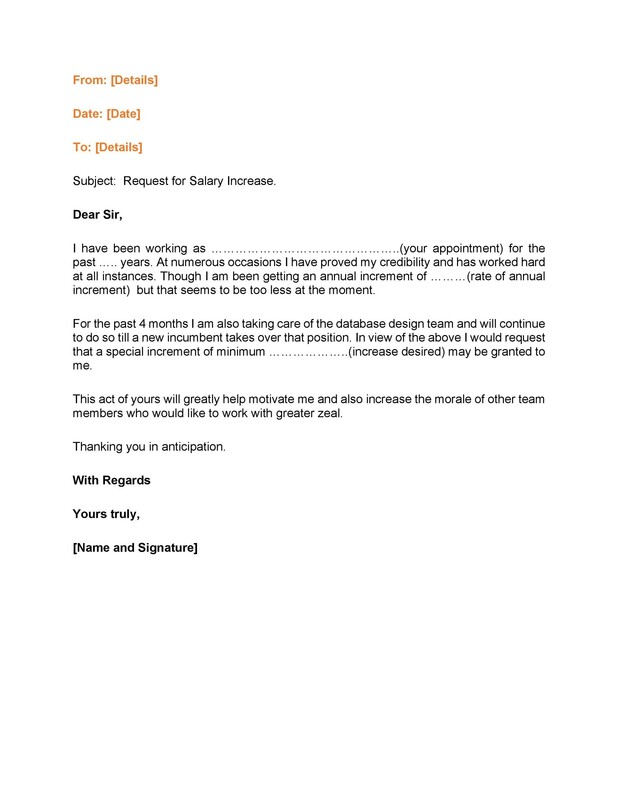 Finally, a salary increase letter can also eliminate any question of your employer taking your request seriously. 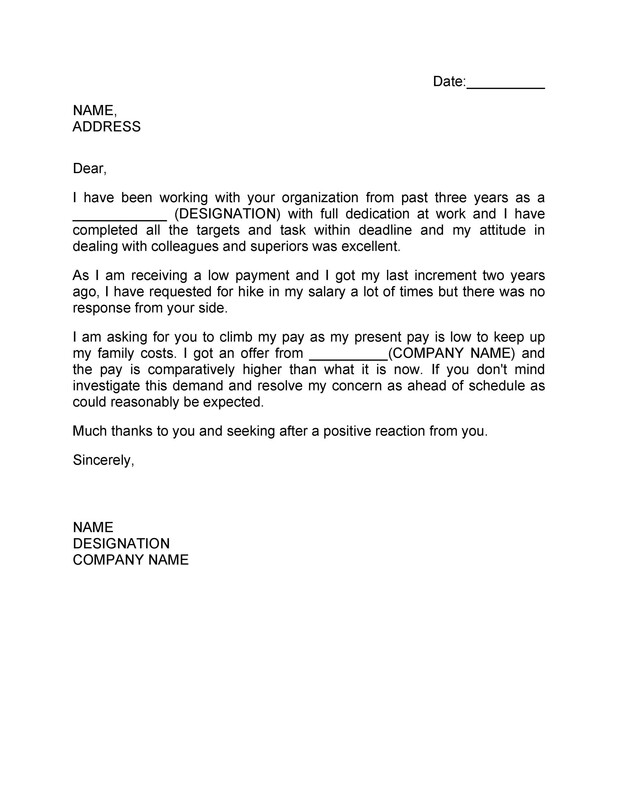 When writing your salary increase letter format, address it to the person at the office who’s in charge of bonuses and pay raises. 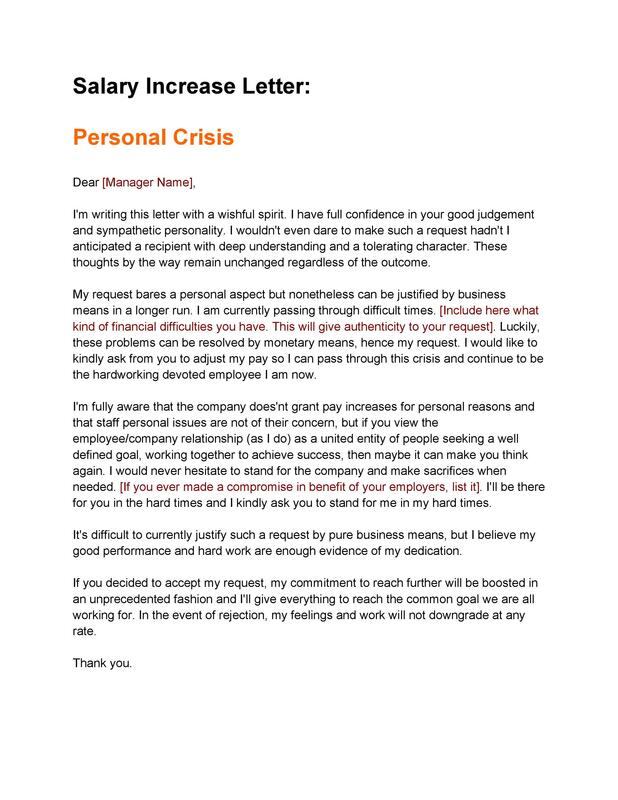 This may be the head of the department, your supervisor or even your manager. Generally, it’s not a good idea to go above this person as it might create the wrong impression. 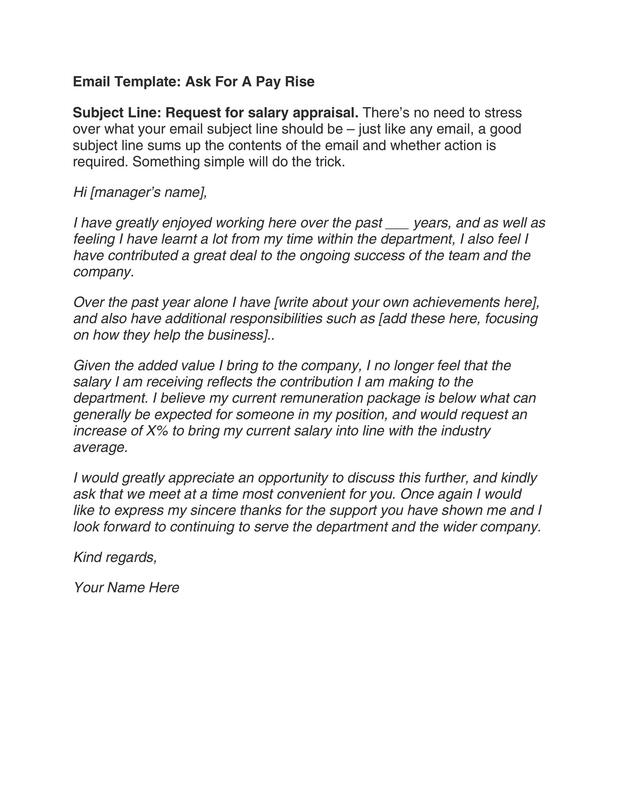 If you check sample letters for salary increase, you’ll notice that they’re written and formatted in a formal manner. 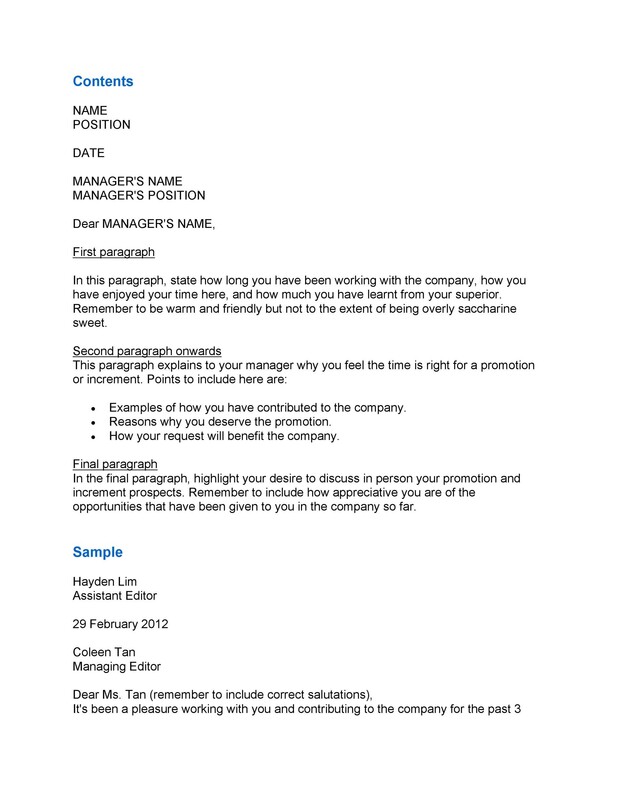 You can download this template to make the task easier or make your own format with the tips we’ll discuss later on. 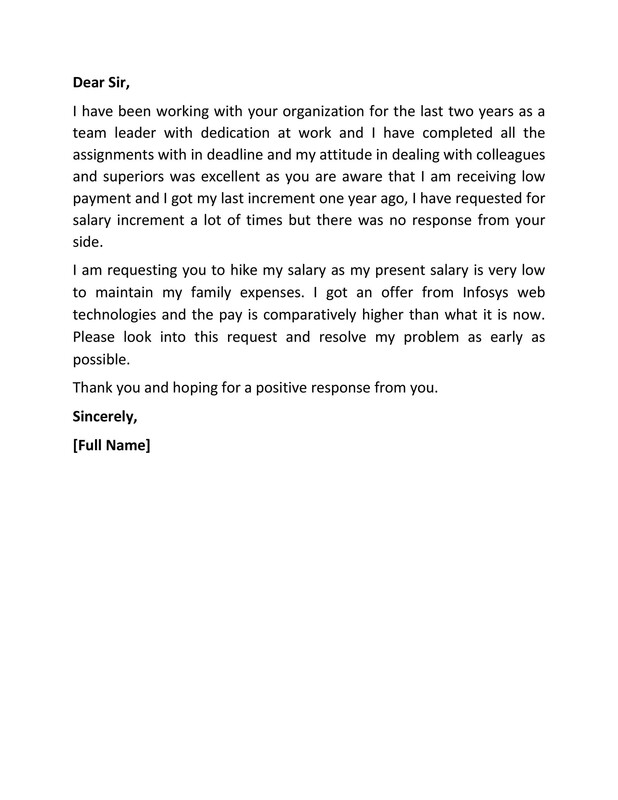 What should you place in your salary increase letter? 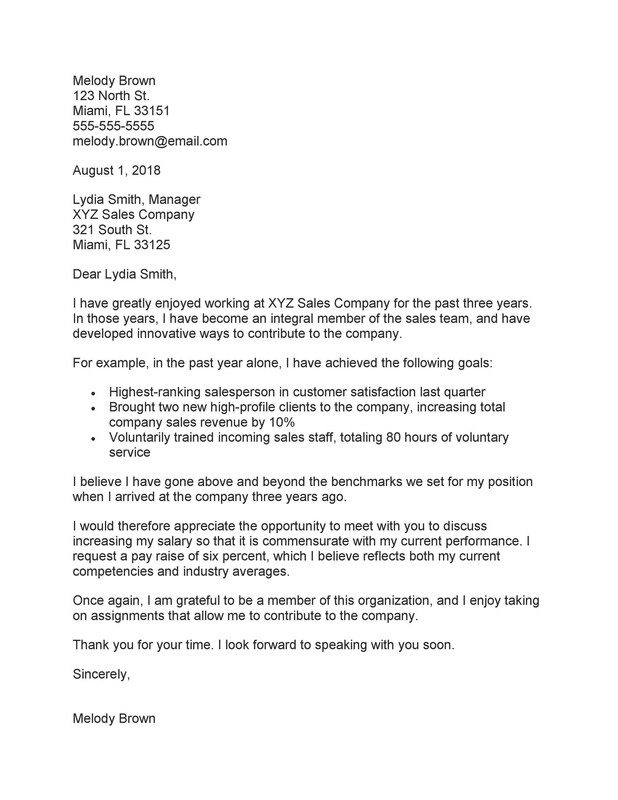 In the first paragraph of your letter, mention how you enjoy working with the company. It’s also helpful to state your job title and how long you’ve worked for the company. 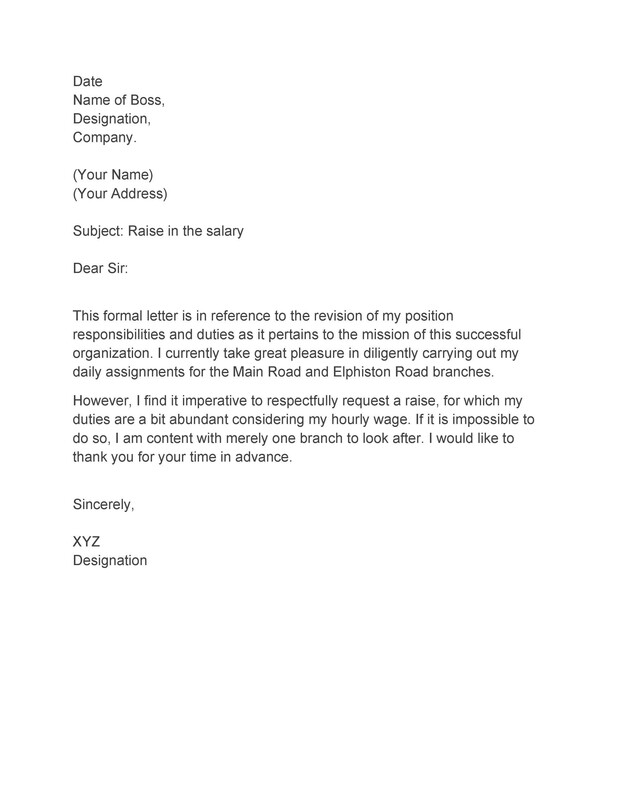 Then explain the letter’s general purpose which is to ask for an increase in your salary. Next up, explain why you deserve the raise. For instance, if you’ve taken on more responsibilities, make a list of all your accomplishments. When applicable, you can use bullet points, highlight the important information, and include some figures. Specify the amount you’re requesting for. Remain tactful when writing this part down to ensure that you don’t sound overly demanding. 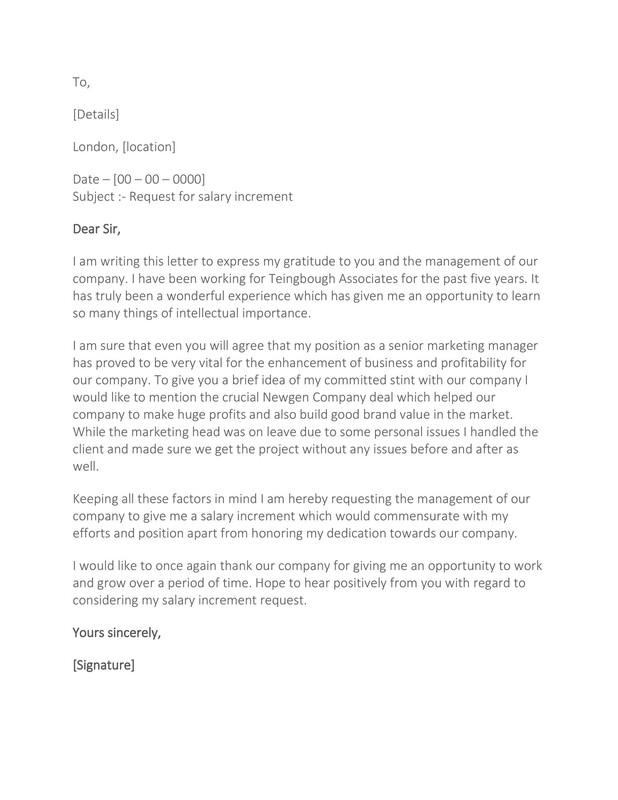 Another way to soften your request is by saying that you’re open to negotiations. 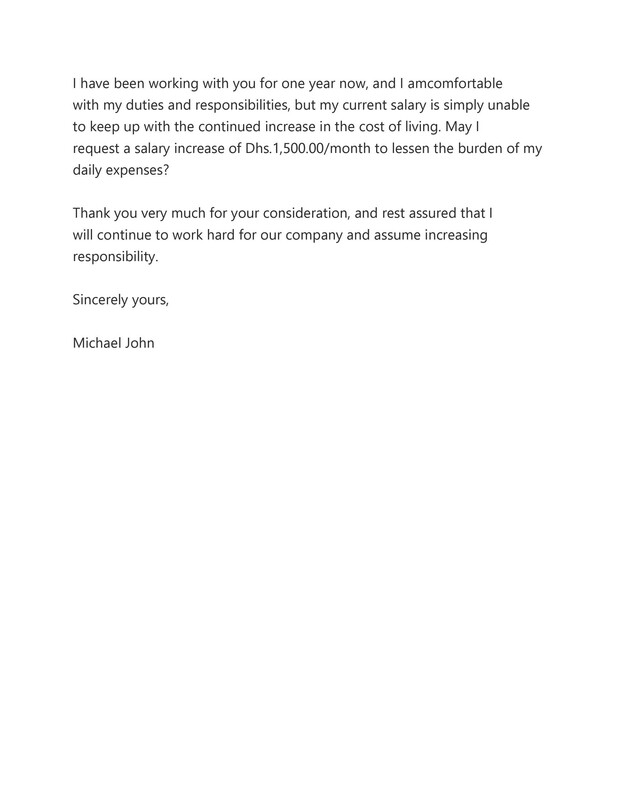 It would be very helpful if your employer sees that you’re willing to negotiate if they can’t afford the amount you gave initially. 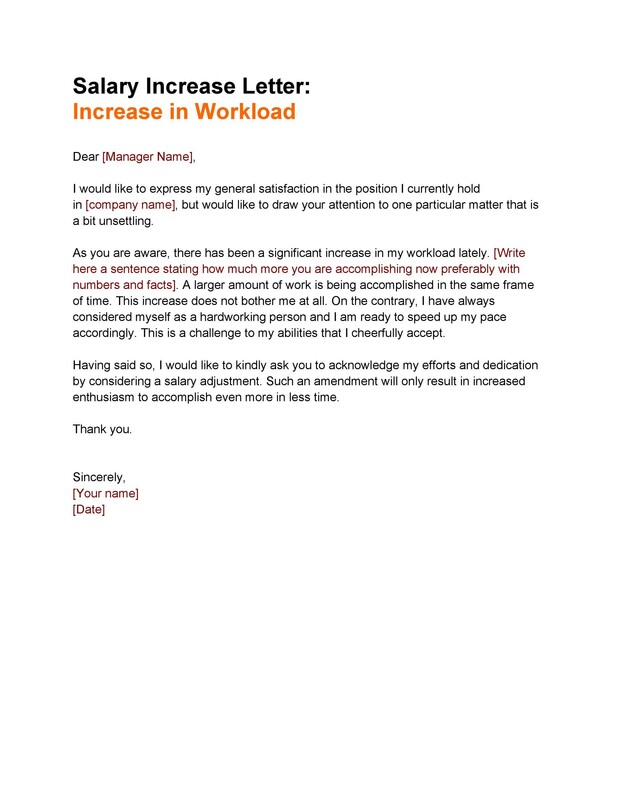 How do you ask for a pay raise? 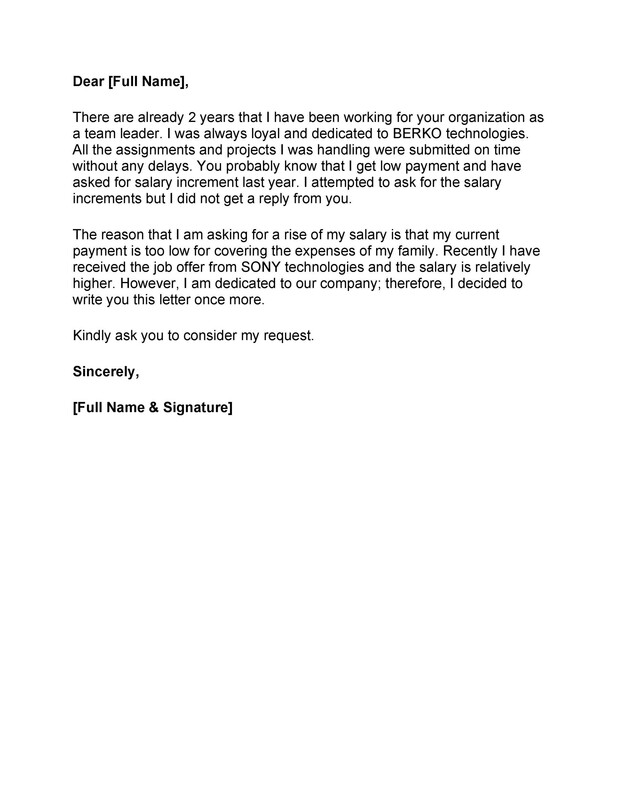 Whether you plan to ask for a small increase or a large one in your salary increase letter, do your research first. 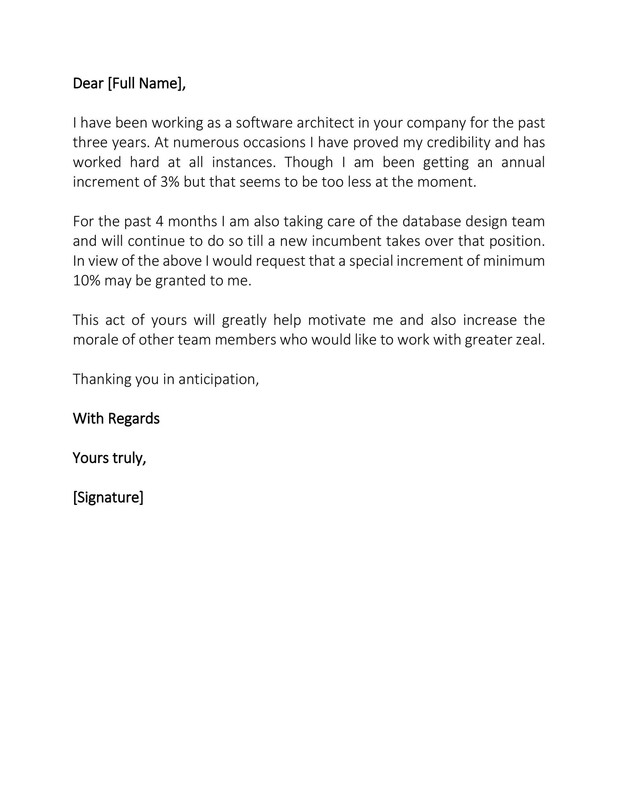 You can ask the HR department how your company computes salary increases then use that information as your leverage. You can also find out what other companies pay to employees who do the same job as you. 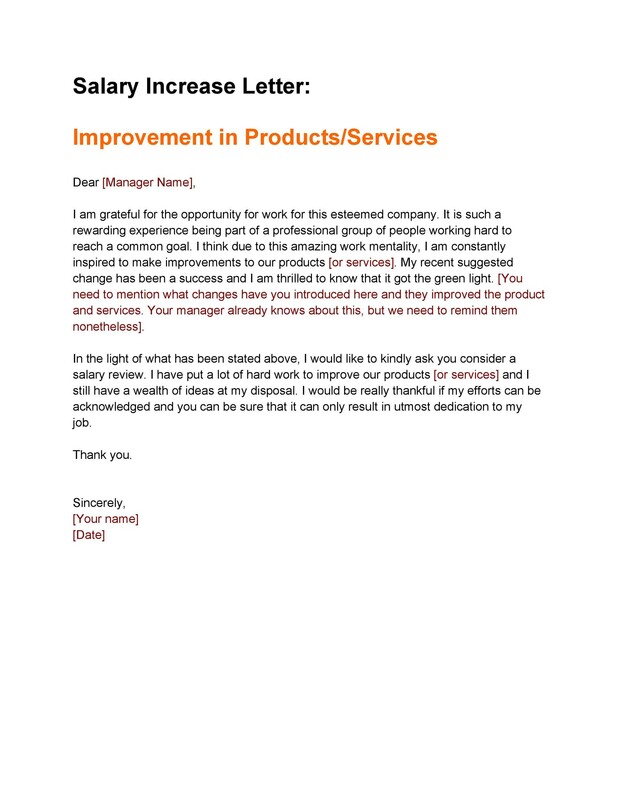 If you’re planning to ask for a salary increase, make sure that you time it right. For instance, it won’t be a good idea to ask for a raise when you’ve already received one fairly recently along with the other employees. Picking the right moment may increase the chances of your request getting approved. 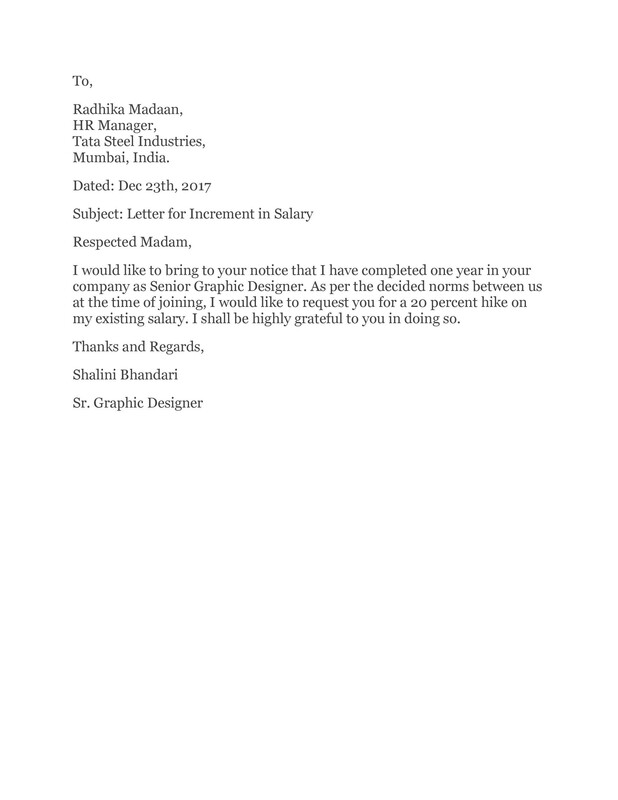 After you’ve written your sample letter for salary increase, request for a couple of minutes along with your employer. Again, pick the perfect time for this moment. The best time would be when things aren’t so hectic at work, and you see that your boss isn’t stressed with everything he still needs to accomplish. 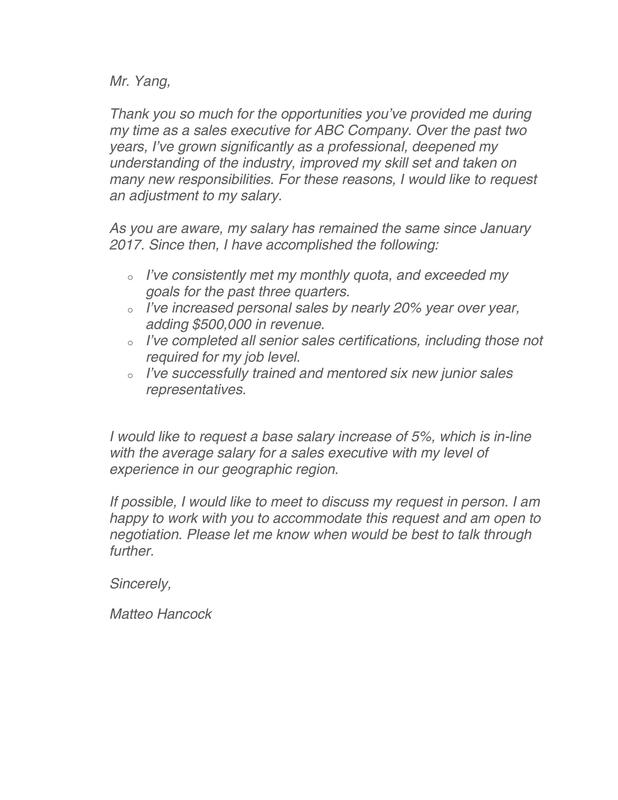 It’s not enough to claim that you want a salary increase because you believe that you deserve it. 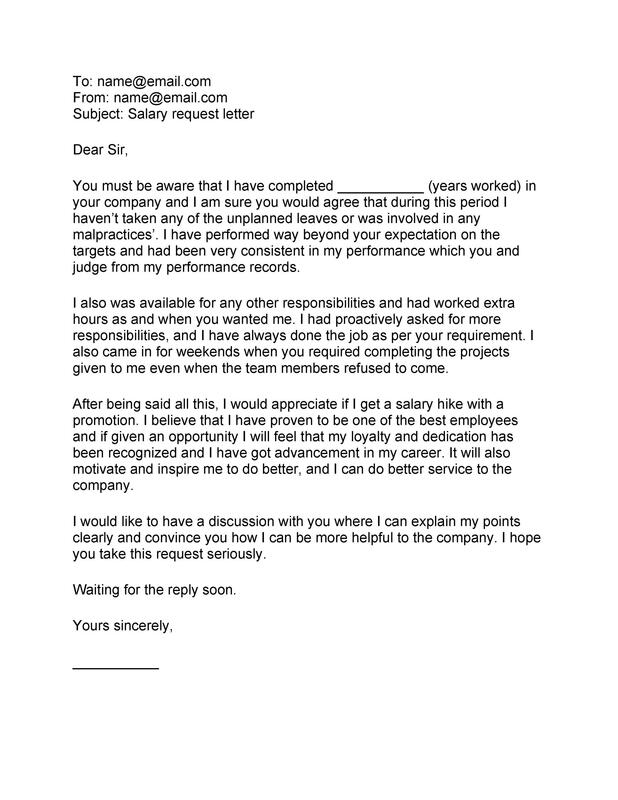 Of course, your employer would require proof. 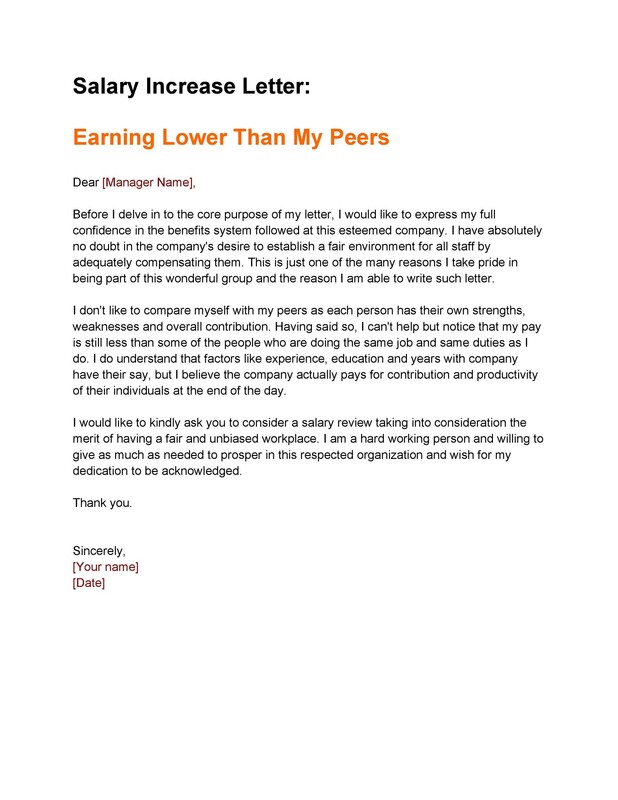 So before going in to converse with your employer, write down some concrete examples of reasons why you should get the pay raise you’re asking for. 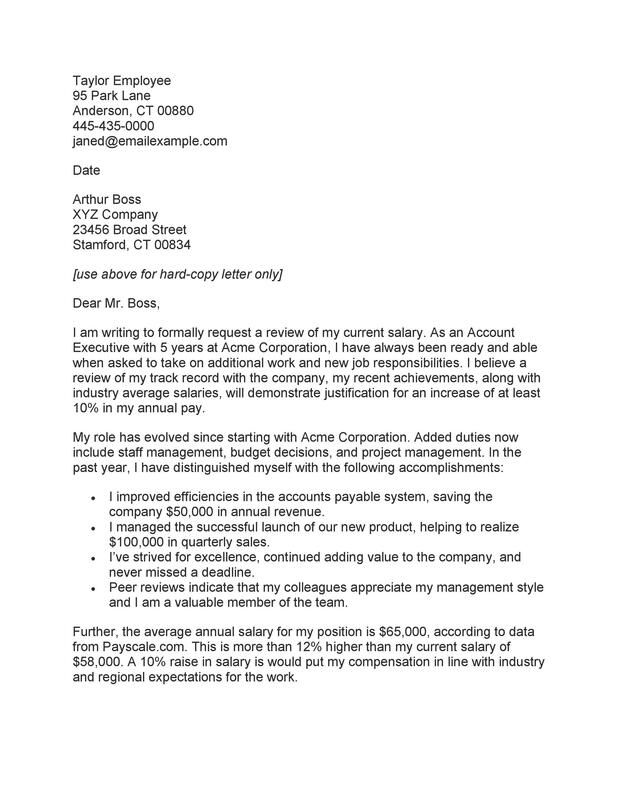 How do you write a proposal for a salary increase? 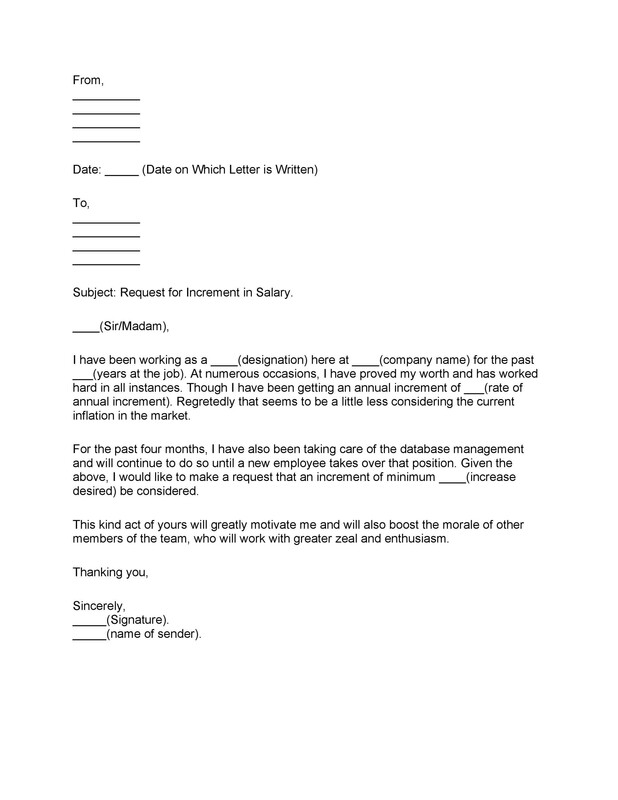 Before composing your letter, evaluate the market value of your job first. Then try to research on how much employees in the same position receive in other companies. Through your research, you can find out if you’re receiving more or less than the average compensation. Think about all of your accomplishments and then jot them down. Be very specific when describing these accomplishments and only include the most significant ones – those which will show your employers what value you bring to the company and why you deserve to get paid more. 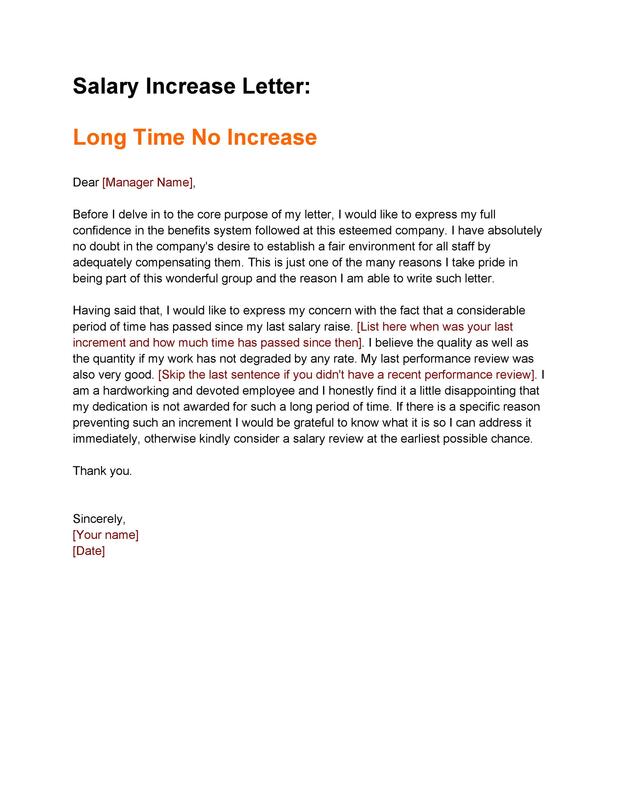 While negotiating your salary increase, consider the non-salary perks too. Although you would like a higher base pay, this is just one aspect of your entire compensation package. Think about whether or not you also want to request for other perks such as stock options, flexible work hours, a bigger job title, and more. Include any information or supporting materials which you believe can help your request. 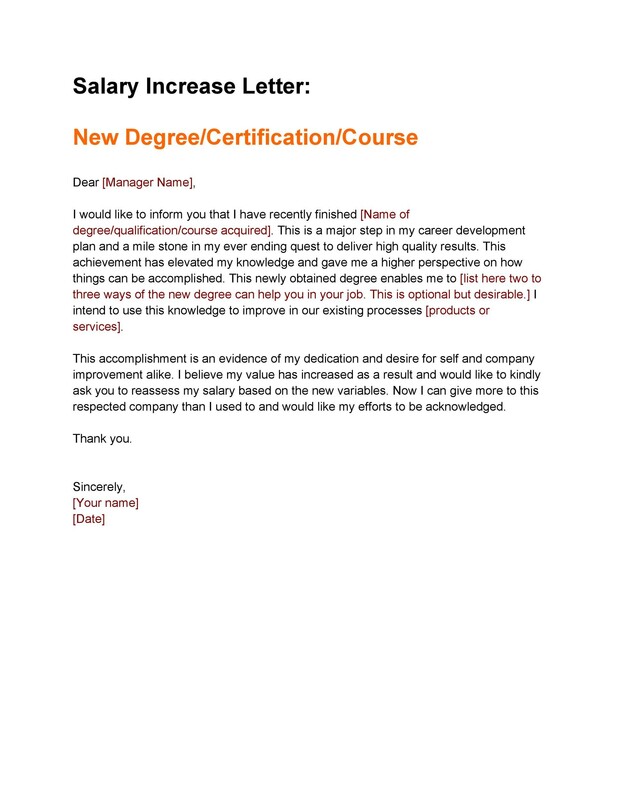 For instance, if you completed an advanced certification or training, attach the document which proves this. Such information may go a long way in getting you the increase you’re asking for. 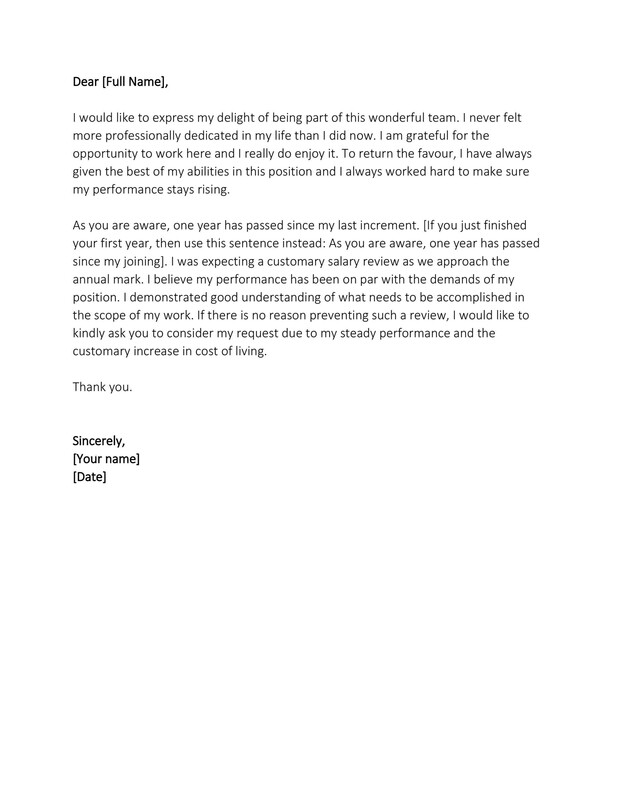 The best letters should fit in a single page. 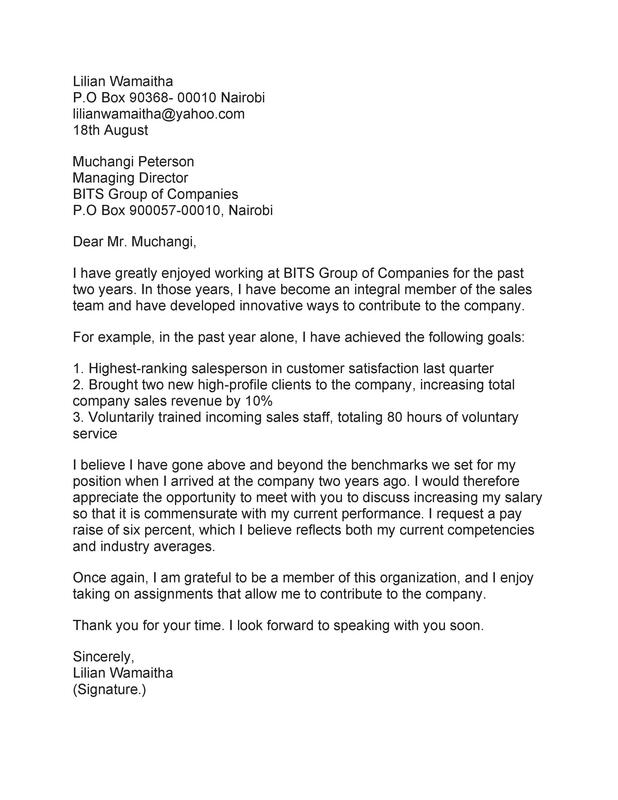 Writing a letter that’s too long might bore your employer and push him not to read it all the way to the end. 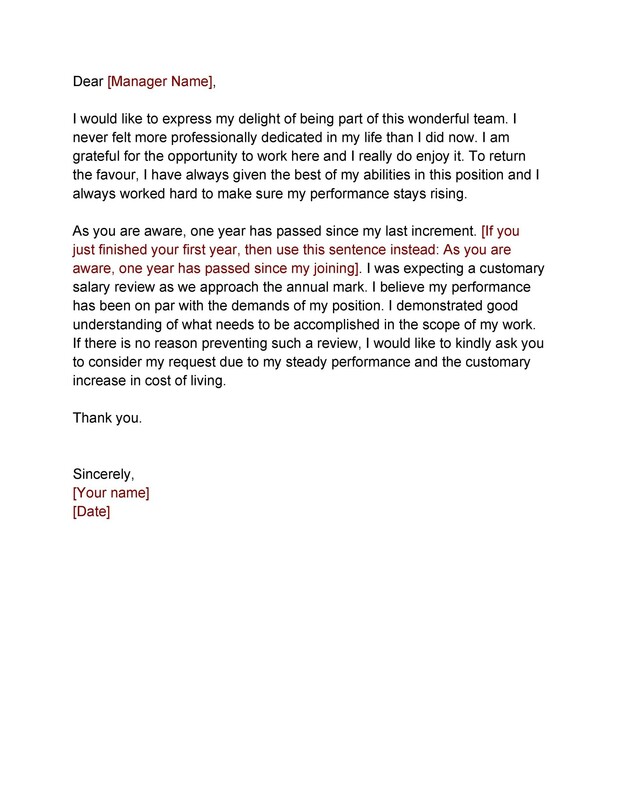 Keep the letter short, specific, detailed, and professional. 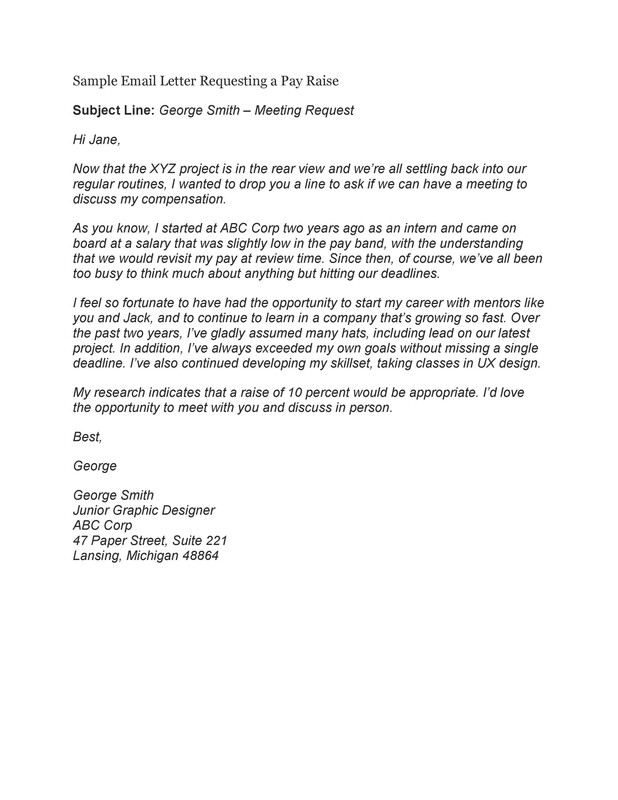 At the top, include the name of the person you’re addressing the letter to, your own name, the date, and the subject heading. 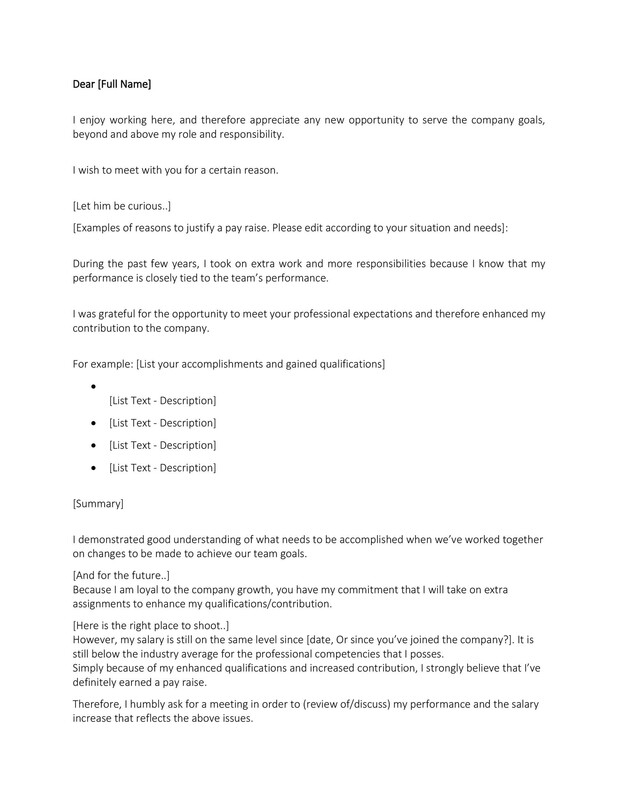 Then make a short summary of your work status in the first paragraph. 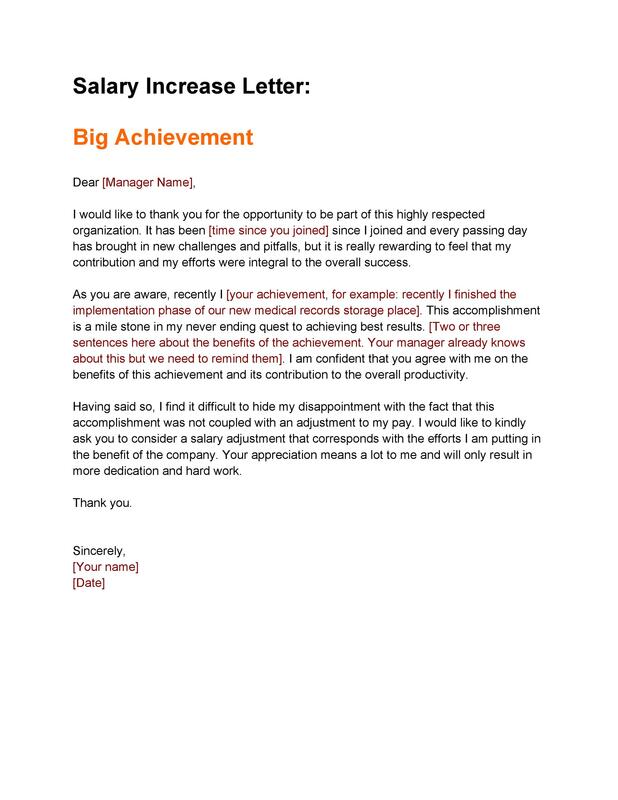 Follow this with a bulleted list of your relevant accomplishments along with any supporting materials. Then state your request before the closing. 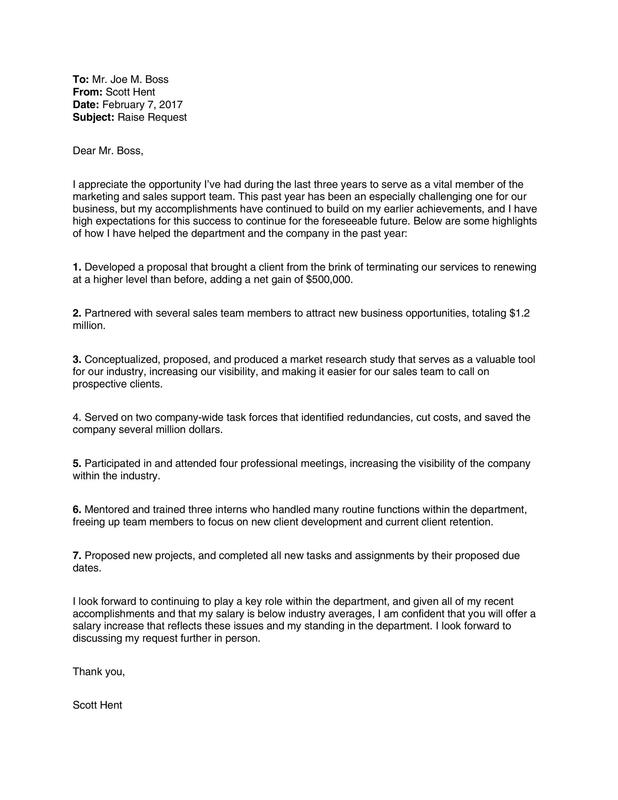 Make sure to proofread your letter first before printing it out to ensure that there aren’t any spelling or grammatical errors. 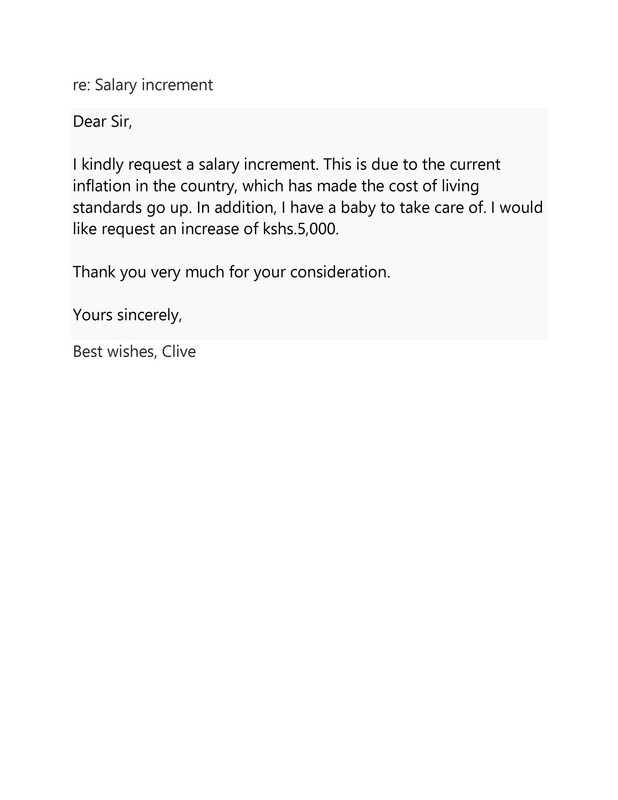 How do I talk to my boss about salary increase? According to research, you have a higher risk of achieving a better outcome if you neutralize all of your negative feelings first. When you’ve decided to talk to your boss about a salary increase, just focus on the things which are truly relevant. 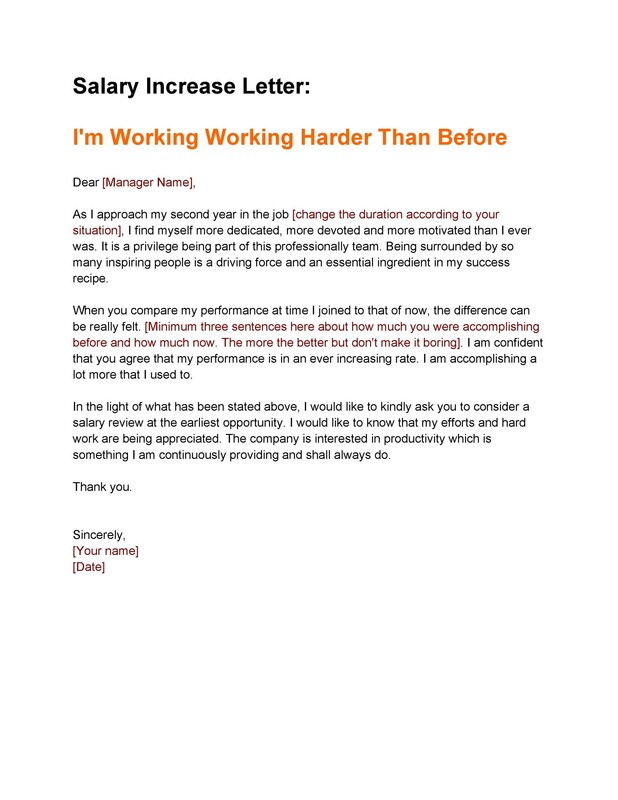 When you’re properly motivated, you will feel more at ease when it’s time to discuss salary. To get the motivation you need, you have to prepare yourself first. 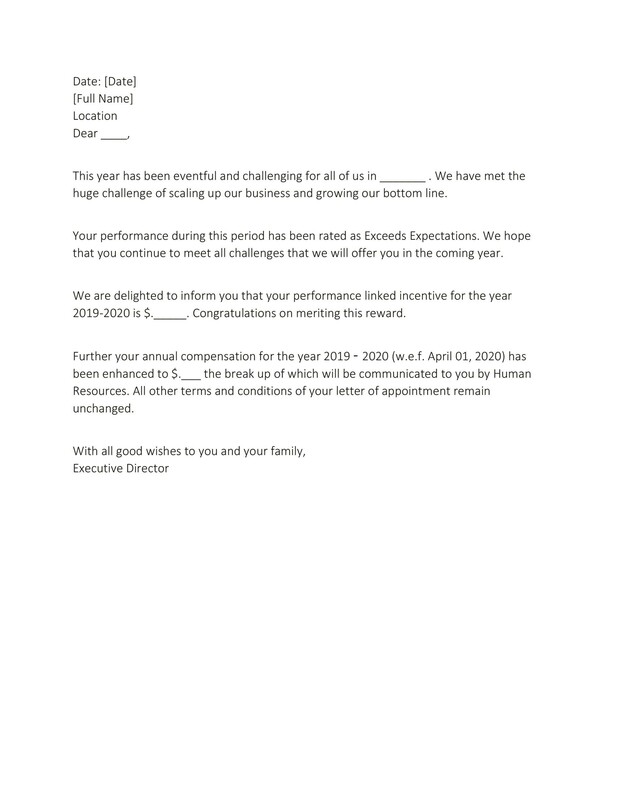 Doing this will also give you the confidence to speak with your employer about the increase. 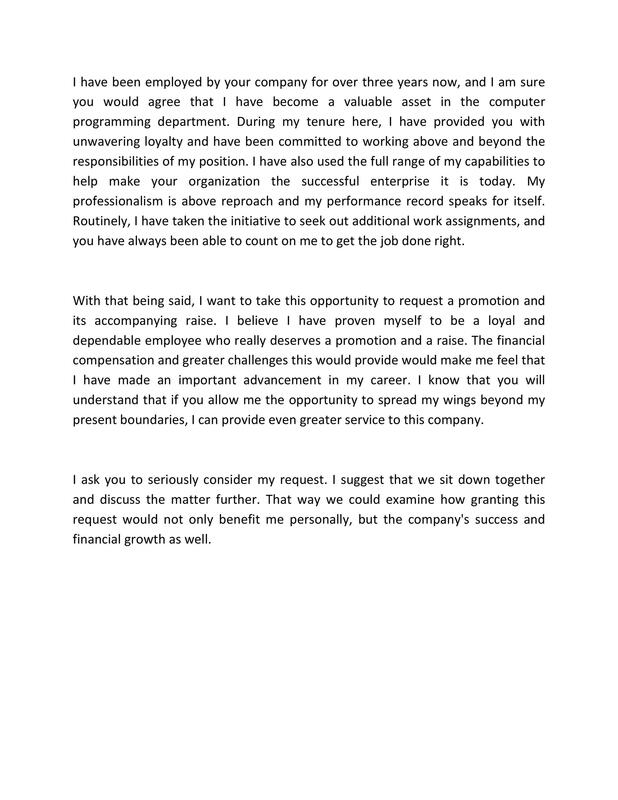 Before writing a letter or speaking to your boss, try to think about the different outcomes which you and your employer can rationally agree to. When you’re asking for a salary increase, you may feel tempted to ask for a huge number so you can enjoy all of the perks. But if you want that raise, you should set everything up so that it’s a win-win situation for both yourself and your company. 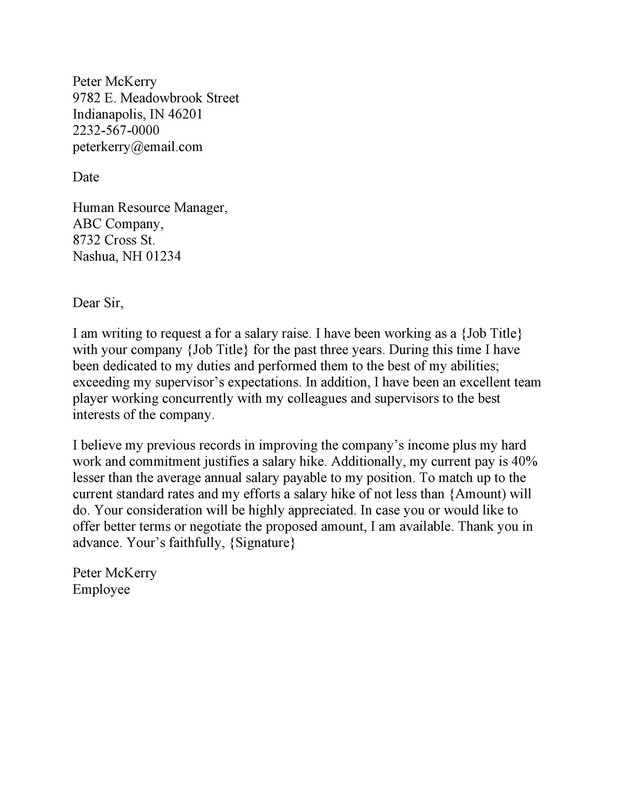 This will show your employer that you want a raise but receiving it will also be highly beneficial for the company.